Last week, in the midst of a raging blizzard, it was the perfect time for English Barleywines. In keeping with the theme of warming beers to take on the nasty effects of winter, we bring you American Barleywines. As you might imagine, the American take on the style is brasher, bolder, spicier, hoppier and of course, less refined. That said, there are many English-style Barleywines brewed in the US (and elsewhere) and American-style Barleywines that fit into, or cross over both style ranges. For this article (and last week’s), for the most part, I will try to simply take the brewers at their word, or go with what the style is listed as in BeerAdvocate.com and/or RateBeer.com. As written last week; Barleywine is a misleading name. It’s not in any way, shape or form in the wine family. It does, however, possess wine-like strength; from between 9% and 13% ABV. Sometimes you will find a Barleywine aged in Sherry or Port barrels (these are generally worth seeking out! ).Deep colored, full bodied, with varying degrees of fruitiness in the aroma and taste, citrus and/or resinous hop bitterness with noticeable sweetness are common to the style. A potent alcoholic kick is a certainty. There are some beers listed as Barleywine that weigh in at fewer than 9% ABV, but they are probably more suited to the Old Ale or Strong English Ale family. Barleywines should be very strong ales! Sharp grapefruit, lemon zest and a bit of a metallic bite provide quite a bite. The piney esters of whole fresh hops and the big alcohol kick remain quite separate from the other tastes, which begin to mingle halfway through the glass. 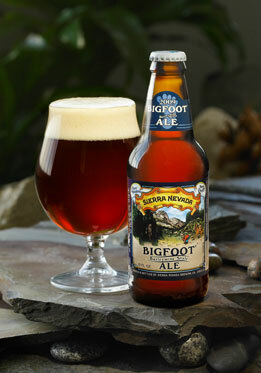 Bigfoot is an original Northwest American-style Barleywine. I hope that just because something else more extreme flavor-wise, or more potent in the ABV department comes along, doesn't relegate this wonderful brew to the back shelf. Long live the legend of Bigfoot! It pours a unique dark and cloudy pine pitch amber. A fast fading beige head leave behind trails of spotty and patchy lace. A fresh-cut piney smell fades into an authentic Old Ale sweet malty aroma of perfumy hop and alcohol. This brew almost begs you to cellar it. And now that it's open, I know why...damn! Sweet toffee and bready malt flavors blend with candy sugar, a light taste of prunes and dark sipping rum. Potent and edgy whole hop taste reveals a sharp white grapefruit bitterness. A hint of black pepper and faint salty taste act as the perfect compliment. Throughout this rating process, I've adjusted my numerical values several times. It's a beer that deserves a long time to age. And if you're unwilling to age it, at least take the time to review it slowly. 22 oz. brown bottle. No freshness date. Flavors of a mixed fruit bowl drenched in dark rum and port wine come to mind. Prunes, raisins, pears, tangerine and pineapple, with a hint of banana. Does this count for my daily fruit intake? The citrusy hops poke through, as does a nice rich malty taste. Sweet caramel adds the right balance to the bold flavors. 2011 Blunderbuss Barleywine – Aged in Port & Sherry Barrels – Cambridge Brewing Co. Cambridge, Massachusetts – 13% ABV - Served in a snifter. It pours a hazy tannish golden color with a thin beige head that was fading as the waitress carried it from the tap to the table. Smells of ripe fruit and sherry rise to greet the nose at once. Mixed aromas of vanilla, fruit cake, figs, burnt caramel, along with whiffs of amber rum drift in and out. I'm almost afraid if I drink it too fast, I'll lose the wonderful and complex smells. The flavors are as inviting and complex as the aromas. The rich and creamy body carries flavors of rum cake, crème Brule, figs, sweet berries, mild citrus, soft herbs, and sherry. If you’re in need of a self-indulgent, decadent Barleywine to pleasure your mind, body and soul, this is the one! Quote: "Brewers enjoy working to make beer as much as drinking beer instead of working." Well, winter is finally upon us in New England. I know I’ve been blathering on for the past month about special warming beers brewed to ward off winter’s nasty effects and we’ve had plenty of near winter conditions, but some lousy weather front, or stupid global warming effect prevents my bold decent into the basement for the really BIG liquid warmers. The time has come! And I couldn’t be happier! It’s Barleywine time! YES!!!! To be honest, I didn’t know where the snow shovel was hiding, but I knew exactly where to find the Barleywine. Some of us have our priorities in order! Barleywine is a misleading name. It’s not in any way, shape or form in the wine family. It does, however, possess wine-like strength; from between 8.5% and 13% ABV. English Barleywine is a deep colored, full bodied ale, with varying degrees of fruitiness in the aroma and taste. Citrus and/or resinous hop bitterness with noticeable caramel sweetness is common to the style. A potent alcoholic kick is a certainty. There are some beers listed as Barleywine that weigh in at fewer than 8.5% ABV, but they are probably better suited to the Old Ale or Strong English Ale family. Barleywines should be very strong ales! American Barleywines are generally more hop-forward ales, while the English style tends to be more rounded, earthy and balanced. A taste of “toffee” is more prominent in the English style, but not uncommon in the American versions. Both styles age very well in a cool, dark place. Serve cool, not chilled. Poured into a slim bodied Lindeman's Lambic glass to create a head. 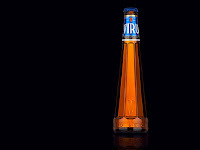 It pours an orange-tinged deep amber with a substantial beige head and solid strips of horizontal lace. A big upfront vintage port aroma along with fresh bread dough, hops, sweet malt, alcohol and mild woody notes comprise a complex array of sweet smells. A full and sweet caramel Maris Otter malt house an amazing variety of flavors. Rich toffee, butterscotch, prunes, coffee, candy sugar and honey. A mild lime-like bitterness and beautifully balanced warming alcohol add just the right amount of contrast to this exceptionally well-crafted brew. Add a touch of creamy sherry and you get the picture. Bring on the winter! Found in the small beer/wine section of the small convenience store next to our hotel in County Hall, Westminster. Served in a globe-shaped glass. It pours an oily golden color with a thin white head along with small specks of lacing. A fumy Triple Sec-like aroma blasts out of the glass at first pour. Sweet doughy malt smells follow close behind. Wonderful fruit and citrus notes play nicely off the maltiness. A light smell of peppery spice floats in late. The flavors mirror the aromas very closely. Add a taste of toffee and a somewhat harsh vodka-like warming alcohol taste in the breath. The mouthfeel is a little syrupy, but that was to be expected. I wanted to grab another bottle the next night, but I guess I got the last one. I do count my blessings though for having stumbled upon a rare find. 12 oz. dark brown bottle. No freshness date. Served in a Piraat goblet. Pours a ruby-hued amber with a 2” off-white creamy head and some patchy and spotty lacing. A rummy and sweet malty smell vie for quick attention. Smells of citrusy and resinous hops flow forward, as does some peppery spice and prune juice. Tastes of toffee and sweet malt are upfront. Flavors of orange zest, rum, tobacco and peppery spices come in right behind. 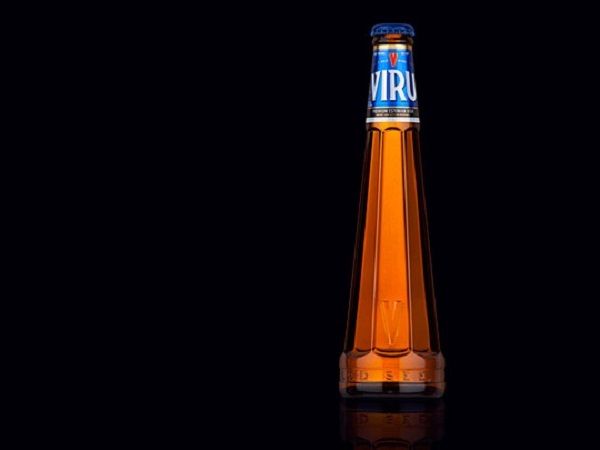 A white rum heat is well masked within the spiciness and hop bitterness, but can be tasted in the breath ½ way through. This is a bit on the thin side for a Barley malt, but not in a negative way. It’s just not as slick and only as many within the style range. Served in a short Corsendonk goblet. Pours a dark woody mahogany color with a creamy inch and 1/2” fast-fading mocha head and some patchy lacing. Smells of mashed figs and plums are upfront, with a whiff of sweet roasted malt. Light citrus notes slide in behind. 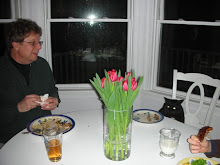 A light whiff of Kahlua is noticed throughout. The flavors, in Shipyard’s style are edgy and bright. Crisp flavors tart orange citrus, tobacco, peppery spice mingles with tastes of toffee, caramel malt, figs. A taste of amber rum rolls in late and hangs around. This is a medium-bodied Barleywine with just a bit of oily slickness to the mouthfeel. It tastes a little stronger than the 8.5% ABV listed. Maybe it will keep folks (me) from pounding it down like a fool. It pours a mahogany/amber color with fast-fading mocha head and a fair amount a patchy and trailing lacing. Big blasts of complex aromas rise at once. Mashed fig, banana bread, Tripel sec, citrusy and resinous hops, peppery spices and white rum, invite inhale after inhale. The flavors are even bigger and bolder than the smells. Tastes range from rum-soaked figs and ripe banana, to toffee and buttery caramel, to Indian pudding, to resinous and peppery spice, and back to that rummy flavor. The tastes sometimes are similar and cross into a Quadrupel-like profile...not a complaint...just my perception. The mouthfeel is wonderful smooth an silky, and not as oily as it appeared when pouring. I was going to cap it, but couldn't resist. Arquabus – Cambridge Brewing Co.
It’s mid-afternoon on MLK Day and the place is packed. But, who are these people? And just what is Yard House? At center stage, is a massive stainless oval bar (think NASCAR track) that anchors the entire restaurant. Lots of glass, stainless and modernistic motifs lend a sort of futuristic and/or industrial look. Flat screen TVs are mostly positioned where they are not in any particular line of sight. It’s a sprawling place yet there’s a logical flow and order to it. Restaurant-style seating surrounds the bar, creating somewhat narrow passageways. But it’s the array of tap handles that draws the attention. Indeed! 114 tap handles! There are good selections of Belgians, Germans, English, US (East and West Coast, plus some familiar locals), along with a line of the usual suspects from the US mega-brewers (who must not be named), plus some of the easy-to-find Euro and Asian selections such as Henie, Stella, Peroni and Sapporo. What’s missing are a few rare, eye-popping, jaw-dropping selections that create that “nirvana” moment for the über beer geeks. But be assured, if you have a pulse you will find something to arouse the buds. Baffled by all the beer choices? They offer a “Six Pack” of 5 oz. samplers. While it might be a nice idea to introduce folks to new beer styles, 5 oz. in narrow cylindrical glasses is too small an amount for the average beer enthusiast to fully capture the essences and nuances of a beer. It would be better to serve 4 - 8 oz. beers in wide mouth glasses. But, that’s just my opinion… A few seats down from us, a guy was rating his Belgian 6 pack sampler starting with the St. Bernardus Abt 12, followed by the Tripel Karmeliet. Good luck tasting the rest! I ordered a Notch Session. It arrived in a standard pint glass with a proper 2” head. It was a bit too chilled, but not frosted. The Tripel Karmeliet arrived in a proper short-stemmed goblet, but it was too cold and the head was a bit stifled. I waited 5 minutes before enjoying. Bliss! The food menu is interesting and varied enough with three full pages of tempting offerings. I ordered 3 different “Street Tacos” (Korean Short Rib, Chicken Tinga, and Korean Pork Belly). When the waitress brought our order, she explained that the chef had only enough pork belly for about ½ of their normal portion. She asked if I wanted to try a different taco option. I told her not to worry about it. The ½ portion was just fine. Long story, short…they took the entire order (which was delicious) off the check. Note to self; It pays NOT to complain! BTW - My wife ordered the vegetarian (with Gardein™) salad and was quite pleased with the quality and quantity of her choice. So, what exactly is Yard House? A sports bar chain? Sort of…I guess you could gather there with friends to watch a game...enjoy some beer and appetizers. Is it a beer bar? In a way…in a pretty big way, though a few of the über beer geeks might whine a bit. Is it a gastro-pub? It could be interpreted as a very large one. Is it a beer-focused family restaurant? Could be. There were families with children. They all seemed content. 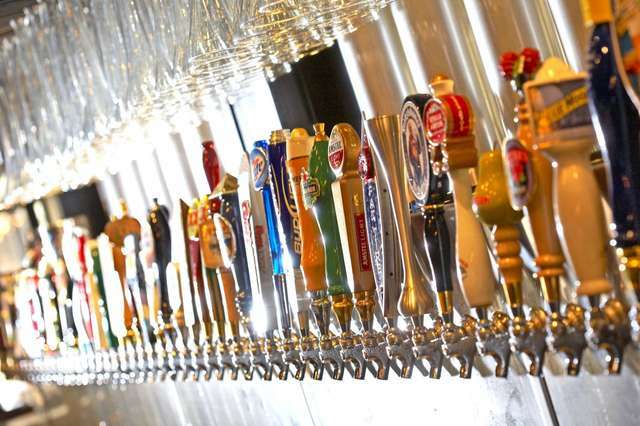 The Yard House can appeal to a wide range of clientele without falling into any clique and that’s a pretty nifty feat! On a side note; There’s a mega-Whole Foods in Legacy Place which happens to have a fairly solid beer section. Now you have an even better reason for getting in the car and visiting the Yard House.